The premise (which I’ve discussed before in this blog) is that millions of American jobs are going unfilled; here CBS points to about 500,000 open positions in U.S. manufacturing businesses alone. 60 Minutes frames this as a puzzle: “How can it be,” correspondent Byron Pitts asks, that in a time of high national unemployment jobs are going begging? Something is wrong, but what? 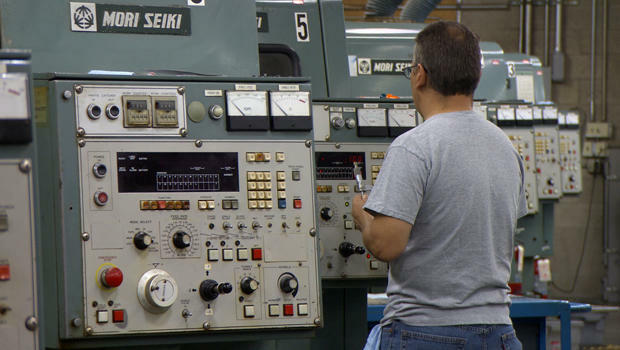 Much of the 12-minute story focuses on the need in manufacturing firms, small and large, for workers trained in emergent production techniques. We watch un- and underemployed Americans participating in educational and internship programs in order to attain eligibility for the new, higher-tech, mostly software-centered manufacturing positions that supposedly abound today. The excitement of those participating in the programs and ultimately the sheer relief of the newly employed are both made very clear in the segment. The head of one family-owned business, Click Bond, a defense contractor in Nevada that makes fasteners for precision machinery (as used in, say, fighter planes), explains that it is not practical or affordable for the firm itself to do the training. This seems like a good argument for community college curricula and other publicly supported education-for-jobs, as promoted by Obama. And indeed, the company helped develop just such a program locally. But then the report digs ever so slightly deeper to ask a CEO of Alcoa why, if such efficacious educational and training options exist, so many positions in U.S. manufacturing remain unfilled. The CEO tellingly answers that, “Well, this is not a society where you can tell somebody what– where to go work, or where to– what education to get, right?” Ah, the shiftless American worker, in every sense of the word! Certainly not racist in the sense of Romney’s old-school bigotry last week regarding Obama’s “gifts” of public health and education to minority Americans, but a classic moralistic put-down of the disadvantaged, nonetheless. Coming from a CEO of a major corporate force in the nation, it’s a potentially influential one, too. Praise to CBS for not leaving that neoliberal shoulder shrug unanswered. Instead, near the end of the segment Peter Cappelli, a Wharton management professor, introduces what is for mainstream media a somewhat shocking point: Maybe the labor market is not, in fact, a supply-and-demand operation. Industrial wages have stagnated and even declined in many production sectors, Cappelli notes. The ostensible fair pay and secure employment said to be just waiting for the willing citizen is at least in part a myth, and one that hides the economic advantages accruing to capital in America. Let’s consider what a viewer new to the topic (and the issue is introduced as something folks may not know about yet… “It’s called ‘the skills gap,’” Pitts intones as the report starts), might take away from watching the piece. Again, all this is very lightly laid on. Robotics are cast as an industrial “innovation” without any mention of the negative impacts of automation on employment levels; there is no probing inquiry into outsourcing trends. But at least 60 Minutes suggests that the idea of a “skills gap” requires investigation, airing however briefly the notion that the interests of American employees and employers do not invariably converge…a convergence implicit in the very notion of such a gap. A glancing blow, yes, and a long way from any kind of redistributive approach that might show the profoundly disempowered situation of labor today, but still an unusual step beyond the unalloyed boosterism that usually surrounds the topic.